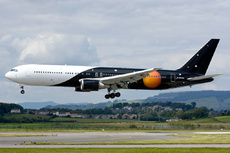 Titan Airways flight ZT941 diverted to Amsterdam-Schiphol Airport, Netherlands, following a 'cabin altitude' warning in the flight deck during cruise flight at FL370. This was the aircraft's first revenue flight following heavy maintenance, during which both positive pressure relief valves(PPRVs) were replaced. A 1-hour post-maintenance check flight was completed the day before the incident, which included a climb to FL350. No pressurisation problems were reported on the check flight. On the day of the incident, the aircraft was planned to conduct a charter flight to Jasionka Airport (EPRZ) in Poland, then return to London-Stansted. The crew included the two pilots and a maintenance engineer who had conducted the check flight the previous day; the engineer occupied the jump seat. As neither pilot had been to EPRZ before, the commander flew the outbound sector, with the co-pilot acting as pilot monitoring (PM). All the flight preparations were normal. The aircraft departed London-Stansted Airport at 09:21 hrs UTC and was step climbed to its cruising level of FL370. As they approached abeam the 'TULIP' waypoint at FL370, the co-pilot answered an interphone call from the cabin service director (CSD) about the seat belt signs having illuminated. On checking the passenger sign switch, he noted that it was in the auto position. At that moment, the cabin altitude aural warning sounded and the cabin altitude red warning caption illuminated. In accordance with the operator's emergency procedure for 'Rapid depressurisation', the pilots and engineer donned their oxygen masks and established communication with each other. The co-pilot had to be assisted with his mask and he thought he may have been suffering some degree of hypoxia. They noted that the cabin altitude was about 10,000 ft and the cabin differential pressure indicator was at about the seven o'clock position, which equates to about 7 psi cabin differential pressure. The co-pilot transmitted a MAYDAY call advising Maastricht ATC of the depressurisation and the crew's intention to carry out an emergency descent. This was acknowledged by ATC and the crew were given a radar heading to fly. As the aircraft had just passed Amsterdam, the crew elected to divert there. The passenger oxygen system was deployed and an emergency descent was commenced, first to 20,000 ft, then 10,000 ft and finally levelling at 7,000 ft. The commander removed his oxygen mask at 10,000 ft, but the co-pilot remained on oxygen until level at 7,000 ft. The crew programmed the FMS for an arrival for runway 27 at Schiphol Airport, where an uneventful landing was completed at 10:07 hrs. External inspection of the aircraft revealed that the indicator flag on the upper PPRV upper door flap was visible, indicating that the valve had operated in flight, allowing cabin air to leak overboard. The failure of the cabin to pressurise correctly resulted from a faulty PPRV which was installed during recent maintenance. The maintenance checks of the replacement valves did not identify the defect with the faulty PPRV. The event was a failure to pressurise correctly, rather than a sudden depressurisation and the crew’s timely actions in identifying the problem and carrying out the appropriate emergency procedure ensured a safe outcome.